Doctor Glenda is hard at work typing something important when--"Urgency Emergency!" --Little Elephant has something stuck up his trunk. What is it? How did it get there? Can we get it out? Doctor Glenda and Nurse Percy work to solve these mysteries with some special tools at the hospital. 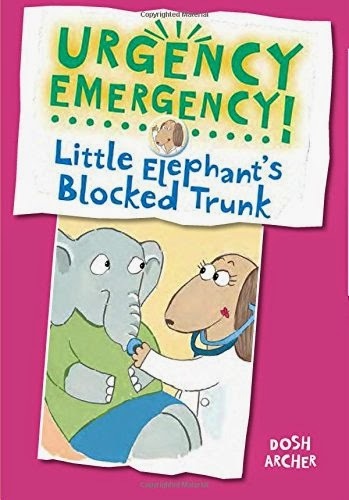 They want to make Little Elephant all better. It's cute. It made me chuckle. But I am slightly disappointed. Because the earlier books in this series were funnier and clever-er. They followed a pattern of fixing fairy-tale/nursery-rhyme characters. For example, Itsy Bitsy Spider is all about making Spider feel better after a terrible tumble out a water spout. And Big Bad Wolf is hilarious, because he might be choking on Grandma. Where does an elephant fit in? Still, this is a fantastic book about doctors and what they might do to help their patients. In a way, it's actually more realistic (instead of pretend fairy-tale characters). I'd think it'd be especially great for those kids who like to pretend to be doctors--they can learn more about the different tools and procedures used. Even if some of the ones in the book are a little silly. So it works. Check it out.